The Sun Guard was a Sith cult and mercenary group, and one of the most feared military units in the galaxy, centered on the planet Thyrsus in the Thyrsus system. Formed by a rebel group of Echani from Thyrsus, the Sun Guard became foes of the Echani and Mandalorians in turn, before evolving into a cult of the Sith under the influence of the Order of the Sith Lords, and eventually brought under the command of Dark Lord of the Sith Darth Sidious. Sidious used the Sun Guard in his plans surrounding his ascension to the seat of the Supreme Chancellor of the Galactic Republic, assassinating key Senators, guarding his Coruscant stronghold, and even abducting Queen Padmé Amidala after the invasion of Naboo. Sidious sent a Sun Guard to retrieve the holocron of the ancient Sith king Adas, bringing him into combat against the Jedi, but when the holocron fell into their hands Sidious executed the man for his failure. Other Sun Guards were considered for the position of prime clone in the Grand Army of the Republic. 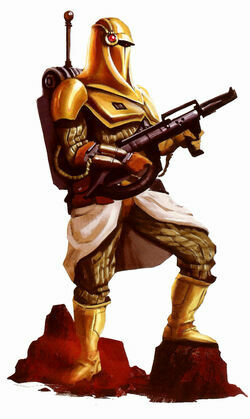 The 2nd Regiment of the Sun Guard fought in the Clone Wars, but were crushed by Republic general Solomahal. When Sidious needed the Sun Guard no longer, his apprentice Dooku ordered his own minion Asajj Ventress to eliminate them. 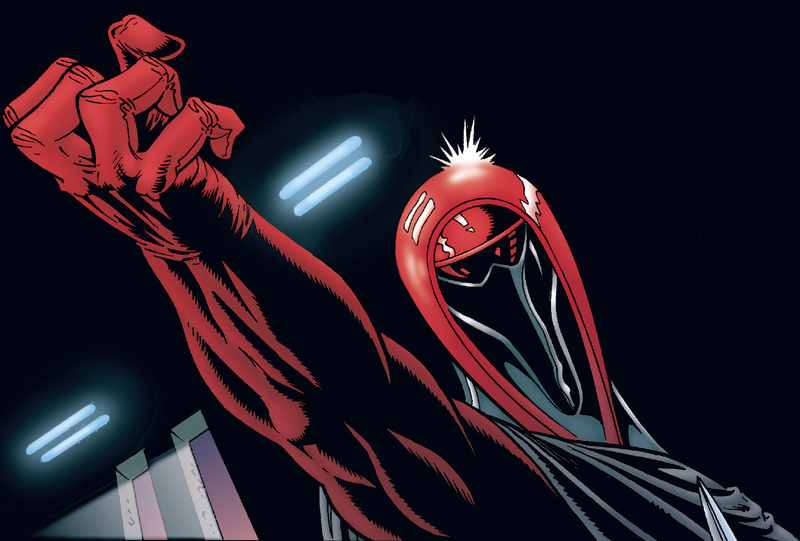 Some of the few surviving Sun Guards went on to join Supreme Chancellor Palpatine's Red Guard, Royal Guard, and for those few Force-sensitive individuals, the Shadow Guard. Though most were not Force-sensitive, the Sun Guard were adept melee fighters, equipped with a variety of weapons built into their recognizable black armor. 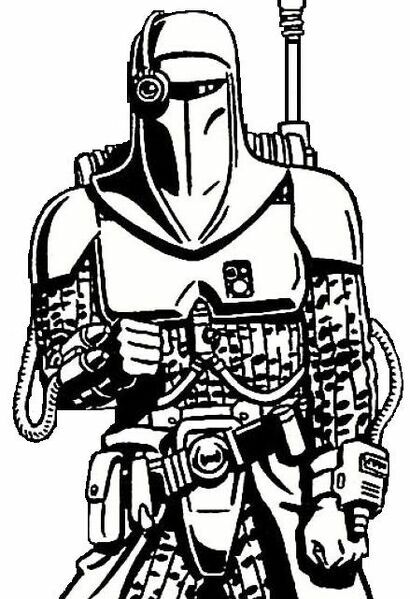 Greatly prizing hand-to-hand combat, the Sun Guard were skilled in personal gladiatorial fighting, urban warfare, and a variety of other techniques; they were unmatched by any opponents but the Mandalorians. The Sun Guards' chief weapon was the pike, a two-handed bladed instrument that could be built in a number of variations for specific tasks. Sun Guard armor proved to be an inspiration for many other armor designs in the Galactic Empire: the uniforms of the Imperial Royal Guard; the specialized stormtrooper armors designed by Doctor Nashiak Llalik; the outfit of Carnor Jax, son of a Sun Guard; and the Sun Guard replica armor of the bounty hunter Moxin Tark. Looks like a Vader under suit. You are correct on the under suit. There are many ties to the Sun Guard. Also looks like you could use the upper half of a TK chest and modded Scout shoulder bells. The soft parts could be borrowed from other OT characters but that cod plate is definately custom. totally different design on the chest piece. This is my first time posting on the boards but I figured it was as good a time as any since I've been giving some thought to making a Sun Guard of Thyrus costume. I realize that they are not "501st approved" (at this point anyway) but I've always thought they were an interesting group; manipulated by Palpatine prior to his becoming Supreme Chancelor, used and then ultimately betrayed during the Clone Wars, the most loyal survivors recruited into the Red/Royal Guard, etc. What little background for the group is pretty good in my opinion. When Galaxy at War came out for the Star Wars Saga Edition RPG I was happy to see the inclusion of the Sun Guard in the book. The new information on the group, like their rivalry with the Mandalorians and how a Sun Guard officer was considered for the prime clone of the Grand Army of the Republic really made me want to work on a costume representing a Sun Guard Stellar Legionnarie (the first rank). The one thing that bothered me about the book was the fact that even though the Sun Guards armor is described as being black and they favor melee over ranged combat the picture shown with the groups entry is of Moxin Tark, a bounty hunter from the old Marvel comic series who wore replica Sun Guard armor. His armor however is yellow and he carries a blaster, not exactly typical for the actual group he based his look on. So even with all the new info there still isn't an actual picture anywhere of a Sun Guard. Thoughts? I must ask, why is this not approved by the 501st? Is it because someone has just not made one yet? Up until the Wii Kinect there was not enough Refs for the Sunguard. I have over the years gathered information and Textures from the game model for that to be used as reference. It comes down to someone completing the costume. Another on my bucket list to complete.